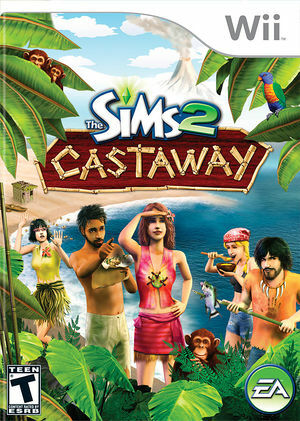 Help your Sims build a life from scratch after washing ashore on a deserted tropical island in The Sims 2: Castaway. Overcome the forces of nature to help them become the ultimate survivors and thrive in this undiscovered paradise while unearthing clues that will lead them back to civilization. Build shelters, craft unique items, and discover many useful treasures and ancient mysteries hidden deep within a diverse jungle environment filled with plants, fruits, and even wildlife. Your Sims change as they take on the challenges of island life and learn to survive in style. Choose from a wide range of Sims - Auto Mechanic, Chef, Doctor, Musician, Teacher, Executive, or Park Ranger. Each one brings a unique Sim humor and quirkiness to your crew. Reunite members of your crew and build a thriving community. Under Direct3D, the censor effect can cause slight graphical corruption. It will return back to normal when the censor effect is no longer on-screen. It can even crash Dolphin after a message box about "CreateTexture failed" or "Poke Z not implemented". Use OpenGL to avoid this problem. This game may crash randomly in-game. In the game pause menu, a black square appears instead of the sim's photo. The graph below charts the compatibility with The Sims 2: Castaway since Dolphin's 2.0 release, listing revisions only where a compatibility change occurred.